Boston, MA (News Transmitter)—Though I knew I liked him, I never knew how much I liked him until, after all these years, I read his book In the Arena. In it Richard Nixon said may important things, and indeed, in my opinion, exonerated himself from the Watergate scandal and furthermore proved that Bob Woodward was not and is as White House staff member David Plouffe put it “a washed-up major leaguer,” but was, in fact, perpetually out of his league, particularly in dealing with Richard Nixon—the greatest American president in my lifetime. Though I am aware that most of my readers grow red, if not pale, at the very idea of giving Richard Nixon a fair reading, or his administration an honest appraisal, without going into detail about the many interesting things the former President said in his book, I would like to recall here one of them that pertains to my situation. “No one should get something for nothing.” Although I, like the tramps on U.S. Hwy 101 that came to his mother and father’s store a-begging, make my living by panhandling, it would not be true to say that I “get something for nothing;” it’s just that those who give do not know what they give for, nor should they, if the principle of charity “do not let the left hand know what the right hand is doing” holds true. Seeing that no rational person does anything not of benefit to themselves, we understand that in giving charity blindly we demonstrate our own morality, not only to the other, but also to ourselves, because the act certifies the truth of the intention. They give to whom they do not know, I also, with my writing, have given to whom I do not know. Both are acts of charity, and both acts stamp the other with moral character. My readers, on the other hand, have seen fit to merely consume. Without giving back to the author, getting something for nothing, they have given momentum to a contemporary “something for nothing” cultural trend which has culminated in the suicide of, not a “prodigy,” but of a-literate, a-linguistic, and a-moral blackmailer to the intelligentsia, Aaron Schwartz, and his followers—who think that through suicide, or other crimes, people like me, far better educated than them, can be forced to work for free. That thing is immoral, but, though it not be charity, there is nothing immoral about being paid for intellectual work—it’s something in between the moral and the immoral—but being paid for work done and services rendered is, strictly speaking not, immoral. Not paying for work done and services rendered, that is immoral. 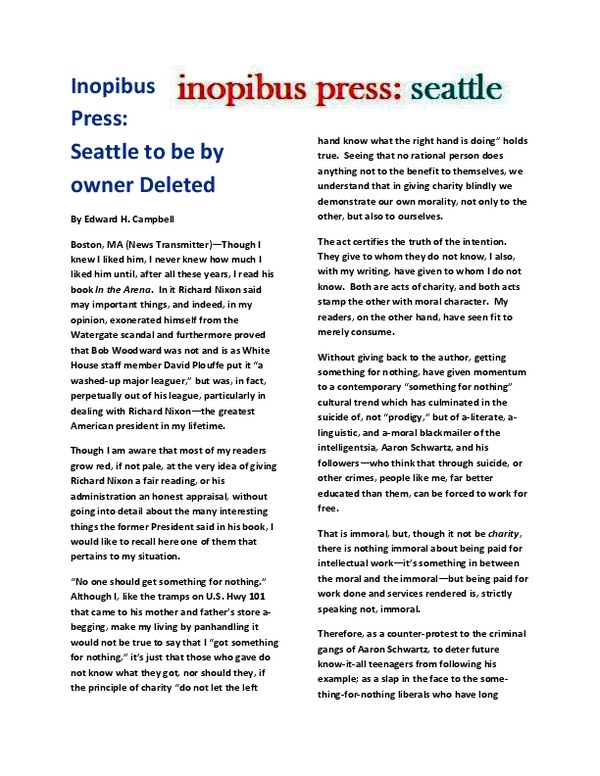 Therefore, as a counter-protest to the criminal gangs of Aaron Schwartz, to deter future know-it-all teenagers from following his example; as a slap in the face to the some-thing-for-nothing liberals who have long exploited my writings, on Inopibus and elsewhere, to their own benefit, giving back nothing, and to the eroticists of Classics department as a whole; to draw attention to the stupidity of a national education policy which emphasizes “math and science” in the interest of “better trained workers,” culminating in James Holmes; and to prove, as I have long professed, that “ignorance is strength;” if I don’t receive a sincere pledge of monetary support to edward.h.campbell [at] gmail.com ; by this time Monday, April 8, 2013, not only will Inopibus Press: Seattle be deleted, and my earlier pledge to withhold my philology to the speech of Diotima of Mantinea of Plato’s Symposium be kept, but will proceed to eliminate more of my websites, asserting Copyright over all my writings, and promising to sue anyone who publishes any of my writing, save this statement.